Last week, my friend Jessica Ogilvie (twitter.com/jessicapauline) joined me on The Banter Blender for some good old fashioned banter. As usual, the topics spanned a large variety of topics, starting with another lengthy dissertation on bagels: how we like our cream cheese, how we feel about the word “shmear,” and other important observations from our Northeastern Jewish perspectives. Eventually, we move on to Hollywood where Jessica tells us about a cover story she wrote for “LA Weekly” a few weeks ago about women in Hollywood. It’s a fascinating glimpse into the gender inequality that plagues the film industry. Finally, we discuss a recent playthrough of the role-playing game “Fiasco” by Jason Morningstar. Yes, role-playing. But this isn’t some retread of “Dungeons & Dragons.” It was our first time ever tackling an RPG, and not only was it one of the funniest nights we’ve had in recent memory, we can’t wait to do it all again. Definitely tune in to hear about this experience. This week on “The Banter Blender,” Angie Thomas (“All the Way”) joins Ben to chat about the usual grab bag of topics: the measles outbreak in CA, Bruce Jenner’s possibly trans journey, the controversy surrounding American Sniper, and, of course, the best bagels in Los Angeles. Come listen! Looking for a bagel in LA? Good luck. The city notoriously misses the mark when it comes to this hallowed specialty. Some say it’s because the water in LA isn’t the same as NY. Others blame general Los Angeles stupidity. I don’t really know where the problem lies, but I can assure you that hope is not lost. 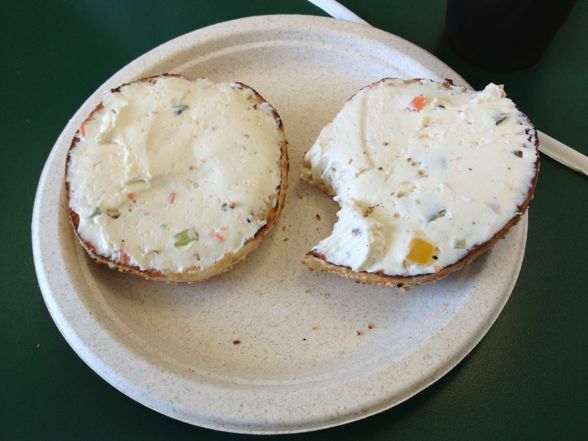 I’ve tried most of the top bagel spots: Brooklyn Bagel Bakery, Sammy’s, Noah’s, Western Bagel, The Nosh of Beverly Hills, and more. Some are solid (Western, The Nosh), some are overhyped (Brooklyn), and some are just expensive and wrong (Sammy’s). In the end, there’s only one bagel place that does it right (or as right as an LA bagel can be): Bagel Broker. Oh, one more warning: this bagel place has become increasingly popular over the years. Not only is it common to now see celebs like Seth Rogen and Charlie Hunnam in the mix, but also long lines. Don’t worry: the queue moves quickly, even when it’s out the door on the weekend. Additionally, the parking lot (located just off Orange Grove Ave and Beverly Blvd) is hellacious. It fills up quickly, often with idiot drivers. The good news is that people leave just as quickly as they arrive. Be patient. Or look for street parking. A good bagel is worth it.